The U.S. Department of Education is poised to spend half a billion dollars to help create new charter schools, while the public is being kept in the dark about which states have applied for the lucrative grants, and what their actual track records are when it comes to preventing fraud and misuse. 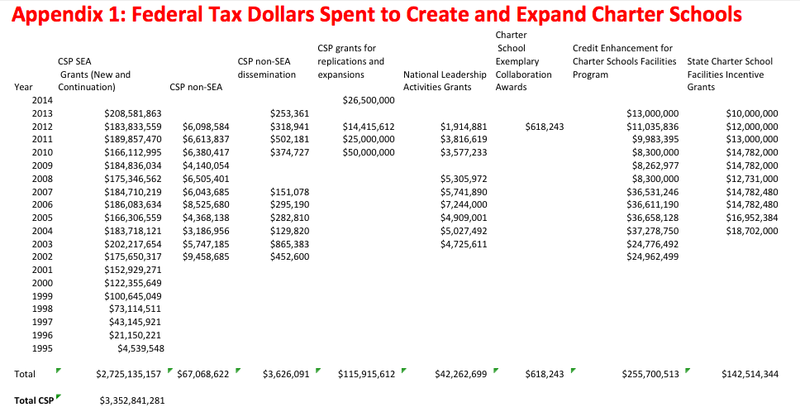 Already the federal government has spent $3.3 billion in American tax dollars under the Charter Schools Program (CSP), as tallied by the Center for Media and Democracy (CMD). But the government has done so without requiring any accountability from the states and schools that receive the money, as CMD revealed earlier this year. Throwing good money after bad, Education Secretary Arne Duncan called for a 48 percent increase in federal charter funding earlier this year, and the House and Senate budget proposals also call for an increase—albeit a more modest one—while at the same time slashing education programs for immigrants and language learners. The clamor for charter expansion comes despite the fact that there are federal probes underway into suspected waste and mismanagement within the program, not to mention ongoing and recently completed state audits of fraud perpetrated by charter school operators. Earlier this year, the Center for Popular Democracy documented more than $200 million in fraud, waste, and mismanagement in the charter school industry in 15 states alone, a number that is likely to be just the tip of the iceberg. Is now really the right time to plow more tax money into charters? The Department of Education is currently deciding what states to award $116 million this year, and more than half a billion during the five-year grant cycle. So who is in the running and what are their track records? The U.S Department of Education has repeatedly refused to honor a CMD request under the Freedom of Information Act for the grant applications, even though public information about which states have applied would not chill deliberation and might even help better assess which applicants should receive federal money. We cannot release a list of states that have applied while it is in the midst of competition." The upshot of this reticence is that states will land grants—possibly to the tune of a hundred million dollars or more in some cases—all at the discretion of charter school interests contracted to evaluate the applications, but without any input from ordinary citizens and advocates concerned about public schools and troubled by charter school secrecy and fraud. But, if people in a state know that a state is applying they can weigh in so that the agency is not just hearing from an applicant who wants the money, regardless of the history of fraud and waste in that state. Despite ED's unwillingness to put all the cards on the table, state reports tell us that Ohio has once again applied for a grant under the program. The state, whose lax-to-non-existing charter school laws are an embarrassment even to the industry, has previously been awarded at least $49 million in CSP money—money that went to schools overseen by a rightwing think-tank, and, more worryingly, to schools overseen by an authorizer that had its performance rating boosted this year by top education officials who removed the failing virtual schools from the statistics so as not to stop the flow of state and federal funds. As The Plain Dealer put it in an exposé: "It turns out that Ohio’s grand plan to stop the national ridicule of its charter school system is giving overseers of many of the lowest-performing schools a pass from taking heat for some of their worst problems." Another component of this plan, it turns out, was to apply for more federal millions to the failing schools that—by a miraculous sleight of hand—are no longer failing. The director of Ohio’s Office of Quality School Choice, David Hansen, fell on the sword and announced his resignation in June. But Democratic lawmakers suspect that this goes higher up in the chain of command, and have called on State Superintendent Richard Ross to resign. Did the scrubbed statistics touting the success of Ohio's charters find its way into the state application for federal millions, signed by Superintendent Ross? What about other states, such as Indiana, with a similar history of doctoring data to turn failing charter schools into resounding success stories? While the known unknowns are troubling, the known knowns—to paraphrase Donald Rumsfeld—are also equally disturbing. For example, Colorado applied for grant renewal this year. But, the last time around, in 2010, the state landed a $46 million CSP grant thanks in no small part to the lax “hiring and firing” rules and the lack of certification requirements for charter school teachers--a reviewer contracted by the U.S. Department of Education to score the application noted. Through meeting minutes from the California State Board of Education we also know that the Golden State submitted an application this year. In 2010, California was awarded $254 million over five years in CSP money, but as the Inspector General discovered in a 2012 audit, the state department of education did not adequately monitor any of the schools that received sub-grants. Some schools even received federal money "without ever opening to students." A review by CMD revealed that a staggering 9 out of the 41 schools that shuttered in the 2014-'15 school year were created by federal money under CSP. Wisconsin received $69.6 million between 2010 and 2015, but out of the charter schools awarded sub-grants during the first two years of the cycle, one-fifth (16 out of 85) have closed since, as CMD discovered. Indiana was awarded $31.3 million over the same period, partly because of the fact that charter schools in the state are exempt from democratic oversight by elected school boards. "[C]harter schools are accountable solely to authorizers under Indiana law," one reviewer enthused, awarding the application 30/30 under the rubric "flexibility offered by state law." The Indiana Cyber Charter School opened in 2012 with $420,000 in seed money from the federal program. Dogged by financial scandals and plummeting student results the charter was revoked in 2015 and the school last month leaving 1,100 students in the lurch. Padua Academy lost its charter in 2014 and converted to a private religious school, but not before receiving $702,000 in federal seed money. Secretary Duncan has previously called for "absolute transparency" when it comes to school performance, but that’s just a talking point unless he releases the applications, or even a list of the states that are in the running, before they are given the final stamp of approval. Have corrective action plans so as to avoid repeating the costly waste and mistakes from the previous grant cycle (such as schools created by federal seed money closing within a few years or never even opening). Because the federal charter schools program is designed to foster charter school growth, which in turn means that money will be diverted from traditional public schools to an industry that resists government enforcement of basic standards for financial controls, accountability, and democratic oversight, the public has a big stake in this and a right to know more, before their money disappears down black holes. Arne Duncan and O'Bama BOTH need to be questioned relentlessly on this issue, and Duncan needs to have some REAL answers, not just more soothing platitudes. Why this level of secrecy? This is what happens when the US Dept. of Education consists mainly of Bill Gates' former employees. Gates is running education in this country, or thinks he is, by spreading his money around. He's meeting with HUGE resistance to his ideas and plans from actual educators and education administrators who are, in fact, looking out for the best interests of actual children. Gates is after the global education profits. We all see that. Can't wait for the day when he becomes persona non grata, especially in the US. In Nevada Gov. Sandoval is directing tax dollars for public education to religious schools. We need our public schools financed with no religion as they are meant to be. There is a petition to stop his religious take over of our schools. Gates (and his villainthropic partner, Buffett), have made claims about their great largesse for years so, why are they still on the richest men lists? Granted, it's difficult to spend down, when your company plots with Pearson, to hawk curriculum for the standards, you promoted. The Department of Education shills for tech companies. It doesn't take much, in the way of real business production, to buy Washington D.C. and state governments. In the past, Microsoft, employed 1/2 the number of Americans as the 50th largest company, a number that is in decline. Business media reported that charter school debt returned,18%, in interest payments to Wall Street, in 2014. Gates worked with Capital Impact Partners, an offshoot of NCB (a government-created bank, for cooperatives) to fund charter schools like those partnered with Netflix CEO, Reed Hastings. It's ironic because Hastings has called for the end of democratically elected boards of education. The charter school plot is far from the spirit of a cooperative. It is, instead, public goods taken over by oligarchs. The final sequence in the plot, is the replacement of public schools with the Gates/Pearson/Zuckerberg-backed, for-profit Bridge International Academies.